NewsReleaseEA is an expert to trade about economic news uses pending orders. Expert receives data for events from 'http://forexfactory.com'." The expert can trade up 28 (31 with yuan) pairs from one chart. Expert has the option for manual strategy (user strategy) or uses one of five included strategies. Expert has analyzer for any trade to show information for any currency and any pair to help trader to make better strategy. This is a free version with restriction about lot size. Always uses 0.01 lot size. You can to get full version from here. Custom_Stategy - There are too many options to make/build own strategy. Recovery_Orders_Strategy - If an order close in the loss, then expert open a new opposite market order to recover losses. Basket_Orders_Strategy - Expert if triggered all pending orders, close all as one in profits or losses. Separate_Orders_Strategy - Expert manage each order separated. Replace_Orders_Strategy - Expert open a new pending order if the triggered order has close in the loss. 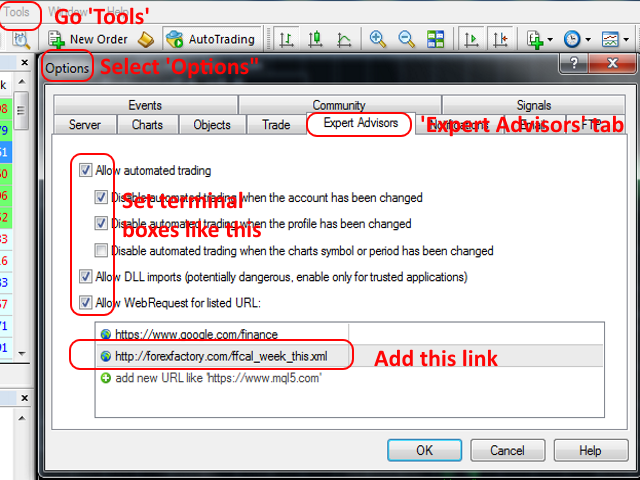 Add URL “http://forexfactory.com/ffcal_week_this.xml” to the list of allowed URLs in the Expert Advisors tab of the Options window (Tools>Options>Expert Advisors). Set news and pairs to want expert use/trade. Set pending orders' and market orders' parameters. Attach expert on one chart (I recommended to attach the expert in a frequently updates symbol). Please make some test on a demo account to see how works expert before using it on a real account. For 0.01 lot size on account with leverage 1:500 needed initial balance at least for each pair 100 to working safely. The expert can't make backtesting, because use economical news on real time. 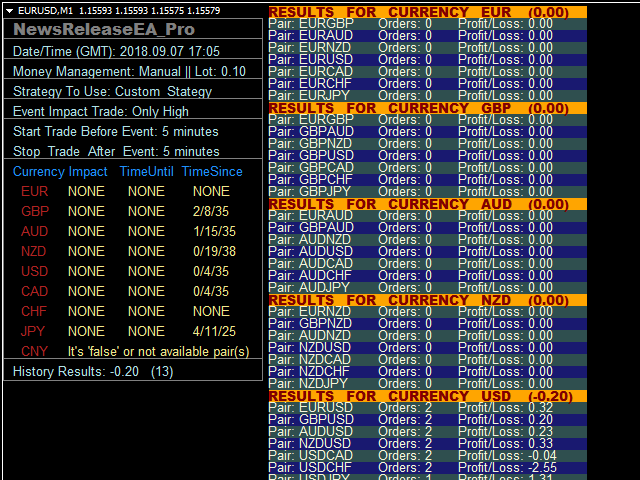 In EUR news can trade: EURGBP, EURAUD, EURNZD, EURUSD, EURCAD, EURCHF, EURJPY. In GBP news can trade: EURGBP, GBPAUD, GBPNZD, GBPUSD, GBPCAD, GBPCHF, GBPJPY. In AUD news can trade: EURAUD, GBPAUD, AUDNZD, AUDUSD, AUDCAD, AUDCHF, AUDJPY. In NZD news can trade: EURNZD, GBPNZD, AUDNZD, NZDUSD, NZDCAD, NZDCHF, NZDJPY. In USD news can trade: EURUSD, GBPUSD, AUDUSD, NZDUSD, USDCAD, USDCHF, USDJPY. In CAD news can trade: EURCAD, GBPCAD, AUDCAD, NZDCAD, USDCAD, CADCHF, CADJPY. In CHF news can trade: EURCHF, GBPCHF, AUDCHF, NZDCHF, USDCHF, CADCHF, CHFJPY. In JPY news can trade: EURJPY, GBPJPY, AUDJPY, NZDJPY, EURJPY, CADJPY, CHFJPY. Fixed bug with gmt offset convertor. Added option to set manually gmt offset. Change comment for currency in orders.